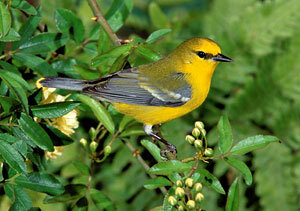 Notes by Susan Billetdeaux: The Blue-winged Warbler is most likely to be spotted low in trees or in undergrowth. The coloring of females is duller than that of males. Blue-winged Warblers often hybridize with Golden-winged Warblers in areas where their ranges overlap, creating interesting plumage variations. Where both species occur, the Blue-winged Warbler's numbers appear to be increasing at the expense of the Golden-winged Warbler.